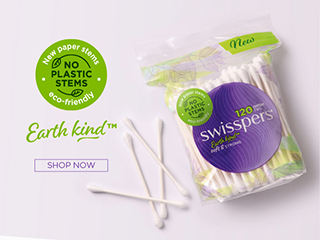 Swisspers Baby Cotton Tips are made from 100% cotton and are uniquely shaped to be extra soft and safe. Use your cotton tip to clean the outer nooks and crannies around baby's ear. Poking it directly into the ear canal can cause damage. DO NOT INSERT COTTON TIP INTO EAR CANAL OR ANY OTHER ORIFICE. Use your cotton tip to clean the outer nooks and crannies around your ear. Poking it directly into the ear canal can cause damage. DO NOT INSERT COTTON TIP INTO EAR CANAL OR ANY OTHER ORIFICE. CAUTION: USE ONLY AS DIRECTED. KEEP OUT OF REACH OF CHILDREN. Always dispose of in the rubbish bin, never dispose in the toilet.